(MoneyWatch) Need to borrow to finance college? You've got plenty of company. Roughly two-thirds of students do. However, it's important to understand that there are two distinct student loan types: Federal loans, offered through the U.S. government, have dozens of protections that you don't get with private loans. Private loans are offered through lenders, such as banks, credit unions, and companies, such as Sallie Mae, as well as through schools. And, while private loans can still seem like a bargain because of their low "teaser" rates, they often cost thousands of dollars more over the life of the loan and leave borrowers with few options when it comes time to repay. How do the loans compare? The interest rate is fixed and is the same for every borrower. The interest rate "floats" based on an index rate, plus a "margin." So, for instance, if the rate was based on prime, plus 9 percentage points, it would currently be 3.25 (prime) plus 9 for a total rate of 12.25 percent. The margin, however, will vary from borrower to borrower based on the credit history of the borrower and, where applicable, the co-signer. Students generally do not need to make payments on student debt while they are in school, are unemployed or in the 6-month "grace period" following graduation. With "subsidized" federal loans - the type given to students who are deemed to have sufficient financial need -- the government pays whatever interest accrues during those periods. That means the borrower's loan balance does not rise while they are in school. "Unsubsidized" federal loans accrue interest at a set fixed rate while the student is in school and the loan is in deferment. Thus, the loan balance at graduation is likely to be higher than it was originally. It is fairly simple for borrowers to know how much they will owe, by using a web calculator such as BankRate.com's Simple Savings calculator. If you were borrowing $5,000 at 6.8%, and figured the loan would be outstanding for four years while you were in school, for instance, you'd plug those numbers into the form and find that you'd owe $6,558 at graduation. Like unsubsidized federal loans, interest accrues on private loans from the day they are funded. However, because the interest rate is variable, it's impossible to know exactly how much you'll owe at graduation. 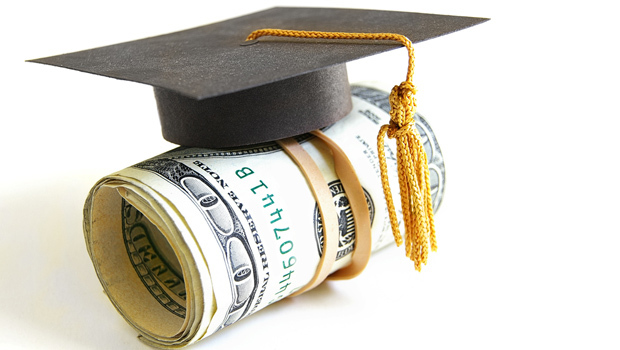 To avoid graduation loan-shock, some lenders encourage or require borrowers to pay at least the amount of interest accruing while they are still in school. All federal student loans come with terms that protect the borrower from economic devastation if they lose their job, go back to school or have some other economic hardship. For instance, repayment of federal student loans can be "deferred" or placed on hold for up to three years, if you lose your job, join the Peace Corps or are called to military service. Repayment of federal loans is also deferred when you go back to school. During periods of deferment, interest will accrue on unsubsidized federal loans, but not subsidized federal loans. In addition, if you don't qualify for deferment, federal loans have additional check, called "forbearance," which can place repayment on hiatus because you are ill, or meet other requirements. Here's a handy guide to see if you qualify for student loan forbearance. Private loans don't necessarily allow borrowers to put their payments on hiatus for any reason. If you have a hardship, you can appeal to the lender for a deferment or forbearance. But whatever your reason, the lender may not agree. And if it does, it may levy a fee (in addition to accruing interest) to provide the deferment. Federal loans now offer seven different repayment options, including "standard" repayment, which pays off the debt in 10 years, and extremely flexible "pay as you earn" plans, that allow you to base your payments on how much you earn. (See "New and improved ways to pay student loans"). Typically provide two repayment options - standard and extended. You generally do not have the right to vary your payment based on your income. If you don't earn enough to repay the loan, you are likely to accrue additional penalties and interest. If you are disabled or go into public service or teach in some low-income areas, all or a portion of your federal loans can be forgiven or discharged - wiped away. The Department of Education has a long chart on the discharge options here. However, federal student loans are generally not dischargeable in bankruptcy. Private student loans are generally not dischargeable in bankruptcy and the federal programs that allow you to discharge the debt when you go into public service or social work do not apply to private student debt.